Eric’s wife Rona, successfully gives birth to a baby boy prematurely. 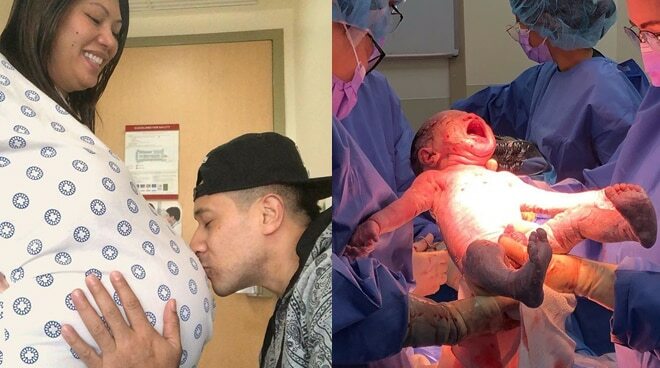 Former It's Showtime host Eric "Eruption" Tai posted an update on his Instagram account about his wife Rona's condition after she successfully gave birth to their baby boy prematurely, earlier today March 5. Eric shared that his newborn son, Legend was born via C-section. "LEGEND ERIC TAI, has arrived and he is a PRE-MATURE MASSIVE UNIT!!! 34 weeks, 7lbs, 52cms long. Delivered by the one and only wonderful Dra. Calayan (@armeecalayan)" he wrote in his photo's caption. The TV host also shared his message to his family and friends, as well as the doctors and nurses that helped deliver his son. "All of our prayers have been answered On behalf of Legend and our ever-strong finally-mother @rownita and yes, we can all finally call you MOMMY after 5 times and 1 SHOT OF #IVF pasok na aagad! Gratitude to all our families, friends and fans all around the world and especially to the helpful, intelligent and hardworking doctors and nurses here at Medical City! "You are all Legends in our books! We got this! Intensive care we go for mommy and legend. Let’s FINISH STRONG!!!! 🏻 🏻 Thank you. Thank you. Thank you. We did it love, i can’t believe it, you did it, you fought strong and hard and never gave up.. we did it peh (@rownita)" he said. Eric first announced his wife's pregnancy last year, August 13. Legend was conceived through an IVF (In Vitro Fertilization) treatment.